His friends are his power and the 2017 Funko Kingdom Hearts Mystery Minis release includes plenty of Sora's friends! 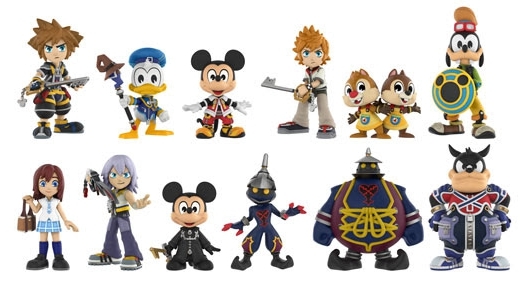 The colorful set features Kairi, Mickey Mouse, Riku, and more from the crossover video game. Likely familiar to some collectors, the miniature set offers a few characters that are similar to their Pop! Kingdom Hearts vinyls. This includes Chip and Dale, Donald, and Goofy. 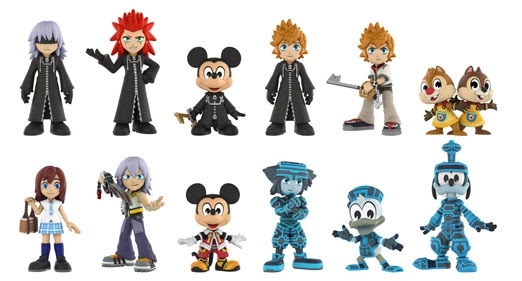 Funko Pop Kingdom Hearts also presents several subjects in their Organization Cloak, such as Axel, Mickey Mouse, Riku, and Roxas. Helping keep each figure a surprise, Funko Kingdom Hearts Mystery Minis is issued in a blind-box format. There are over 20 figures to locate, including retail outlets that carry at least three exclusives, making the completion of an entire set quite an adventure. 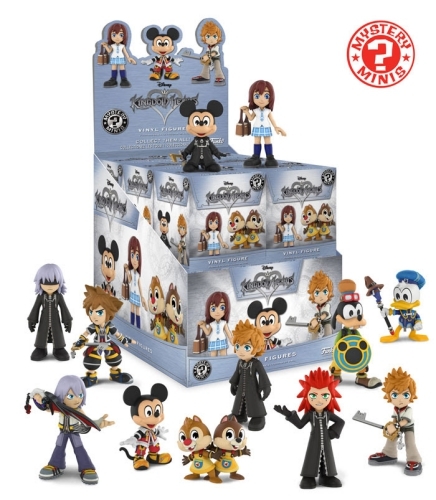 Order Kingdom Hearts Mystery Minis on Entertainment Earth. Villains Pete, Large Body Heartless, and Solder Heartless are GameStop exclusives. 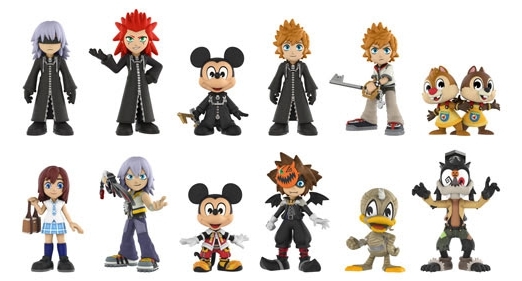 Donald, Goofy, and Sora dressed in Halloween costumes are issued through Hot Topic, while the same trio disguised as Tron can be found at Toys R Us locations. Since each case holds a dozen figures, collectors wanting the entire set will need more than one. There will also need to be trips to each retailer for the exclusives. Known odds for Funko Kingdom Hearts Mystery Minis are noted below. Funko Mystery Mini Kingdom Hearts - Chip and Dale - Series 1 + 2 Other Figs! View related Kingdom Hearts figures with our other Pop! guides.